Maist representatives hae colourfu spottit coat paiterns, stripit huifs, mottled skin an white sclera veesible aroond the iris whan the ee is in a normal poseetion. 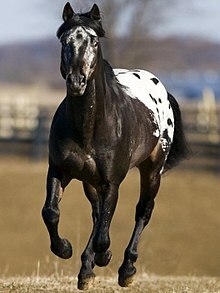 The Appaloosa is an American horse breed best kent for its colourfu spottit coat paitern. This page wis last eeditit on 18 Mairch 2018, at 02:19.